January 28, 2019 at 4:48 pm. I have always taken exception to the banter and chatter through what is basically fans that NBA players don’t care, don’t play hard or they don’t play as a team. Lately, much of that has subsided regarding the Golden State Warriors dynasty, the facilitation on superstar players on the point, and then the relentlessness on the defensive end despite changes in rules that vehemently favor offensive play. I drove the trek that is from Tampa to Orlando last Friday to watch the Orlando Magic play the Washington Wizards in a matchup of two teams not likely to compete in the playoffs in April. For those of you not familiar with Florida traffic, it’s worse than anything L.A. every dealt me when I’ve gone out for a combination of Angels/Dodgers/Padres baseball games in the summer. It literally took three hours to go 112 miles that Friday afternoon. “For the love of the game,” I replied, not even thinking of the fact the Wizards were without John Wall, who has been shelved with a foot injury for the rest of the season. The game didn’t disappoint as the Wizards held off an Orlando fourth quarter surge to take a 95-91 win. All of the components that I see in the NBA were on display. The pride of these players and the coaches and the sharing of the basketball from two teams who were focused and in attack mode although it has been a tough campaign for both. 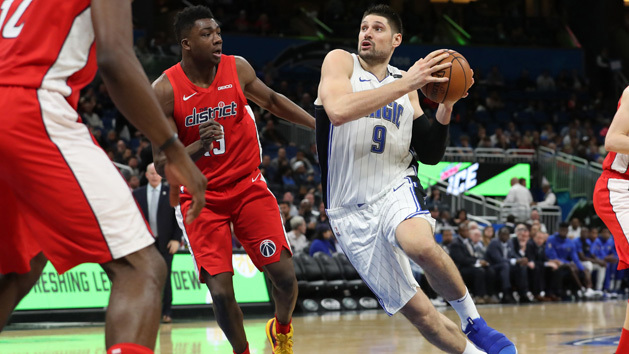 Orlando came out attacking with Nikola Vucevic in the middle as the Wizards do not have a legitimate big man, but do have role players in Thomas Brown and Ian Mahinmi. Washington countered with Bradley Beal on the point as he has taken over Wall’s duties due to the injury. The Magic trailed 73-55 with over four minutes to play in the third quarter as Beal had worked the point perfectly in finding his own shot and then allowing Jeff Green, who played the five position for much of the evening, to find his three-three-point game. Green finished with 24 points behind Beal’s 27 as he made six of nine three-point shots in going 9-for-16 on the evening. The care and the passion from the Magic at that point needs to be underscored. Here is a team that is struggling across the boards in losing four of their last five which dropped them to a season low eight games below .500 after the loss. Orlando started 3-of-21 from three and finished only 7-of-33, but Terrance Ross brought the Magic into position to win the basketball game with his pride and passion as he picked up his three-point game with six points in a 12-2 run late in the third period to cut the Wizards’ margin to 75-69 after three periods. Ross picked his game up even further in the fourth quarter as he roamed the perimeter, much like Green had done all evening. He found his rhythm and found his shot and his talent and professionalism continued to peak. His triples cut the lead back even further to 80-77 with 8:20 remaining. He finished with 16 points and four assists in 33 minutes and potentially should have been the primary option in Orlando’s attack late in the game. As the pride of the Magic continued to show, they caught Washington at 87-87 on a dunk by Johnathan Isaac off the break with 4:24 to play. Then, a Vucevic layup gave Orlando its first lead since 25-24 as Orlando led 91-89 with 1:37 to play. The two teams’ emotions wore on their jerseys like the unneeded corporate ads on the upper left side of their jerseys. Beal was front row and center with his driving dunk which tied the game at 91. He later found Green for a layup as they went ahead for good at 93-91. Vucevic’s disappointment and depths of that emotion were paramount after the game as he missed two free throws with 59 seconds remaining as he could have broken the 91-91 tie and that would have brought about a different mode of attack and strategy for both teams. Walking away from Amway Center, this game was just as I thought it would be. Two teams showing their pride and professionalism on a basketball floor as the records and issues around the teams dissipate when the referee tosses the basketball to start the game.